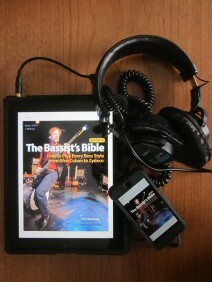 The Bassist’s Bible is available as a Paperback with two CDs and one DVD or as an e-book with embedded media files. Be sure and check out the special offer below to get the 1st and 2nd editions of the book for one low price from See Sharp Press, exclusively available from this site. This cool new book seeks to describe all that the average player will need to know to have a workable familiarity with nearly every common musical style. 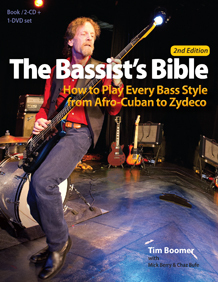 Read the complete review at Bass Player dot com. Shop online using these links below. Thank you everyone for such positive reviews! All contents copyright 2015 by Tim Boomer. Thanks to Wordpress, and to Cryout Creations for the Nirvana Theme. Other site design by Tim Boomer. Photography by Micaela Marsden, Mateo Carr, Tim Boomer, wikipedia, and courtesy of Paul Jackson.